Rhinos, crocodiles, and deadly snakes: oh my! One factor these animals certainly have in common is that they are very dangerous. Typically weighing near 8,000 pounds and measuring up to six feet tall, rhinos are deadly. Armed with a menacing horn, this species, unlike other large mammals, are aggressive by nature even though they are herbivores. Commonly found in Africa and Asia, these endangered animals will charge when attacked by a predator. 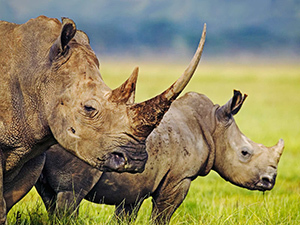 Despite their aggression, rhinos are currently facing a huge threat. Sadly, their numbers have fallen because they are poached for their ivory horns--the trait that makes them so lethal may also be their downfall. Unlike rhinos, some animals are subtle hunters and prefer to wait for their prey by lurking underwater. Crocodiles, for example, can grow as long as a limousine and have fierce reputations as hunters, flashing mouthfuls of teeth, crocodiles wait for hours in the waters of southern Florida, the Caribbean, southern Mexico, and even Australia. Like rhinos, even though crocodiles are able to kill animals several times their size, they have an endangered status. Contrasting rhinos and crocodiles, some animals do not have to be big to be dangerous. For example, some snakes can use their elastic jaws to devour animals many times their size. These silent reptiles utilize their hyper-alert sense of smell and touch to find their next meal. The snake slithers through a variety of habitats, from swamps and forests to grasslands and deserts. Although snakes fill many with fear, most are not dangerous. But when threatened, they can kill. Rhinos, crocodiles, and snakes vary in size, diet, and appearance, but one thing is for sure: they all have the potential to be deadly.